Suburban Aluminum Anode Rod absorbs the corrosive action caused by hot and/or harsh water. Give your Suburban or Mor-Flo Water Heater a longer life by simply replacing the anode rod! What is an anode rod in a hot water heater? Anode rods are there to protect your hot water heater tank from elements in the water that attack and gnaw on metals in your tank. This Suburban Water Heater Aluminum Anode Rod replacement is for RVers who live where there is hard water (magnesium rods last less than a year in these conditions), or RV owners of a Suburban or Mor-Flo Water Heater. Replacement of an anode rod can add years of life to your hot water tank, as harsh water eats away at the anode rod, it is not eroding your tank or the other metal components inside of your water heater! 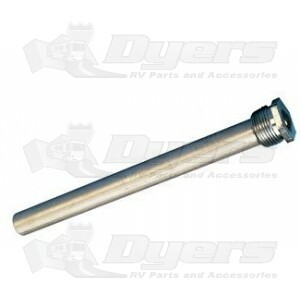 Simply unscrew your current anode rod and install this Suburban Aluminum Anode Rod in its place, it is that easy! You have a choice for RV hot water heater replacement parts. At Dyers we strive to give you lots of information and options all in one user friendly website, thanks for stopping by! Use Magnesium rods for Atwood and the Aluminum rods for Suburban & Mor-Flo water heaters. Equalizes Aggressive Water Action Providing Cathodic Protection For The Tank. Important Factor In Tank Life.